I am a sick, die-hard denim addict. And guess what? There is no cure. No amount of rehab could ever tear me away from the lure of those blue threads. In fact, I will go on record to say that with the exception of this newfound love for rusty cognac, indigo and all its jean hued derivatives is just about the only colour that my colourblind wardrobe can muster. 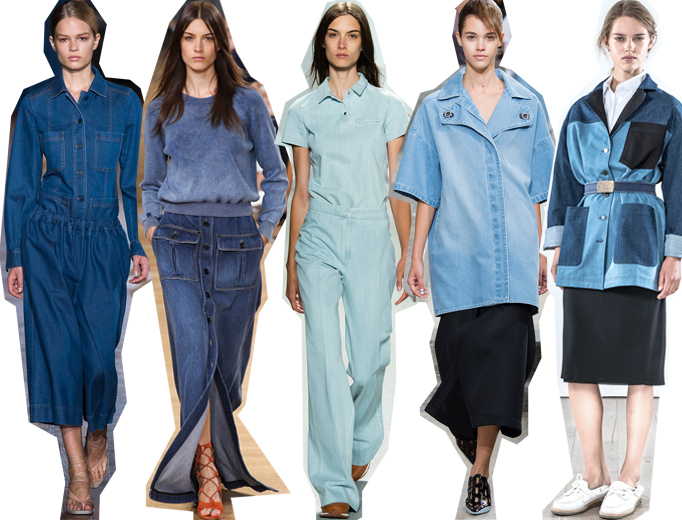 Thank god, then, for Spring-Summer 2015, which sees denim make quite a loud splash on the high fashion scene. From floor-grazing skirts at Chloéand washed-out one-pieces chez Lacoste, to oversized tunics and cinched jackets aplenty (see: Kenzo, Elisabeth & James), and head-to-toe jeanwear (introducing the city-girl boilersuit), get ready for a catchy symphony of blues on repeat all summer long. Heck, even patchwork is clamouring for a comeback. And the minis(plural)… Oh, the possibilities are endless! So let’s be clear, this tune is set to be as catchy as Taylor Swift’s latest release, so don’t even think of trying to shake it off. Embrace the street’s favourite fabric and don’t let the rest of the world make you feel guilty about an addiction that quite frankly will rocket you lightyears ahead in the never-ending quest for cool.